The only other Celtic legend that is more clear and possibly about the deluge that flooded Doggerland is in the Irish Book of Invasions/Conquests (see earlier post in this thread). In THIS POST I talked about "Nehalennia", an ancient sea/fertility godess venerated at the southern coasts of the North Sea (and also in some places up the Rhine). The origins of this seagodess are very uncertain, and the godess may not even Germanic or Celtic in origin. Where did the name Neeltje Jans come from? Neeltje Jans was the name given to Nehalennia by the local population. Nehalennia, Nehalenia, Nehalaenniae, Nehalaenia; all of these are different spellings meaning “Lady of the North Sea”. No one is absolutely certain of the meaning of the name. Apparently in the 18th century a ship named Neeltje Jans sank on a sandbank in the Eastern Scheldt and the sandbank was then given the name of the ship. However, no proof of this claim has ever been found. Some people think that the name Nehalennia is derived from the Hebrew words ‘nahal’, meaning to guide and ‘aniah’ meaning ship. This would indicate the meaning to be ‘guide the ship’, i.e. he who guides the ship(s). Haale = ancient name of the North Sea, as the region used to be called where now the Flemish and the Zeelanders live (sometimes pronounced as Hale (n). This could also explain the various spellings found on altar stones, e.g. Nehalennia). The exhibition room at Deltapark Neeltje Jans houses a cast of a temple stone from a temple dedicated to the Roman goddess Nehalennia. Similar stones have been brought up out of the water by fishermen near Colijnsplaat and Domburg. Not far from Neeltje Jans, there is another sandbank and this is called Vuilbaard. Deltapark Neeltje Jans has taken inspiration from this sandbank to develop a new character, which we have named Zoutbaard. The word baard is thought to derive from bard or singer (minstrel). Zoutbaard is the minstrel who serenades the mermaid Neeltje Jans. It is known that the Phoenicians sailed to England during the tin trade, around 450 BC ("Himilco"). We know that Phoenician was related to ancient Hebrew, and the godess may originally have been a (sea)godess of the Phoenician pantheon. If that is true, then this thin lead is a dead-end. As much as I hate speculation based on legends, I don't see what the problem is with the frost giant flood you mentioned. A flood is a flood and the giants killed were the frost giants. The flood of Doggerland sort of corresponds to the "death" of the frosty ice age, doesn't it? Seems less of a stretch than an awful lot of other posts I've seen around here regarding the sources of legends. The problem is that it could mean anything because it doesn't contain a lot of detail concerning a flood, it's much too general.... a giant dies, his blood spills, voila, a flood. But it appears the only myth with something resembling detail is the Irish Book of Invasions/Conquest. I mentioned the Fomorians of the Irish "Lebor Gabála Érenn" (Book of Invasions of Ireland). They were there in Ireland a couple of centuries before Partholan, the Tuatha De Danann, and the Firbolg; these other peoples arrived after the "deluge". The Fomorians were described as people with the body of a human and the head of a goat, or something. To me that means people wearing something of a helmet with horns attached, much like the way we see the good old Vikings. They were seen as seafarers, pirates, an evil lot. Wherever they came from has not been recorded, but their name (see earlier posts) might point to Scandinavia. Scandinavia just means from somewhere from the east/north east - of Ireland - here. Maybe Scotland, maybe Scandinavia, maybe people from Doggerland who travelled around the north of Scotland (well, that's what I think it means). Now, the most ancient inhabitants of Scotland were the Picts. And up to know, no one is sure who these Picts were, what language they spoke, and how long they lived in Scotland. So, the question is: were the Fomorians the same people as the (later) Picts? Next question: if the former is true, might they have been refugees from Doggerland?? Keep in mind that the 'Norse' golden age was from 800-1200CE: IOW, they're almost as removed from the Doggerland Flood as we are. One other point: any northern flood legends probably incorporated a religious element and may have been deliberately suppressed by the Church... possibly by superimposition of the Noah legend (to go back towards my original suggestion). The golden age of the Norse as a people with that name, yes. But they (and/or their ancestors) were there a lot longer, and much more ancient elements, parts of ancient stories may have been saved in the stories we still know of now (like the Edda). About the influence of the Church (by its monks, the ones who put the ancient legends on paper), yes, I know about that, and I already mentioned it. That is the big problem when trying to find something that pre-dated Christianity. History of human settlement in what is present day Norway goes back at least 11,000 years, to the late Paleolithic. Archaeological finds in the county of Møre og Romsdal have been dated to 9,200 BCE and are probably the remains of settlers from Doggerland, an area now submerged in the North Sea, but at the time a landbridge that connected the present day British Isles with Jutland. The Fosna-Hensbacka culture inhabited parts of Norway about 8,300 BCE to 7,300 BCE. The Komsa culture was a stone age culture of hunter-gatherers that existed in northern Norway from around 10000 BC. The culture is named after the Komsa mountain in the community of Alta, Finnmark, where the first remains of the culture were discovered in 1925. The distinction between a “Komsa” type of stone-tool culture north of the Arctic Circle and a “Fosna” type from Trøndelag to Oslo Fjord was rendered obsolete in the 1970s. Nowadays both phenomena are ascribed to different types of tools of the same culture. The commonly held view today is that the earliest settlement of the North Norwegian coast originated on the western and southwestern coast of Norway and ultimately in the final Palaeolithic Ahrensburg culture of northwestern Europe. The Komsa are thought to have followed the Norwegian coastline when receding glaciation at the end of the last ice age (between 11,000 and 8000 BC) opened up new areas for settlement. Some elements may have moved into modern-day Finnmark from the northeast, possibly coming from ice-free coasts of the Kola Peninsula, though evidence to this formerly widely held view is still poor. Archaeological evidence indicates that the Komsa culture was almost exclusively sea-oriented, living mainly off seal hunting and being able boatbuilders and fishermen. In comparison to the southern Norway's contemporary Fosna variety of this same culture, stone tools and other implements appear relatively crude. This has been explained with a paucity of flintstone in the region. The Fosna/Hensbacka (ca.8300 BC - 7300 BC),or (12000 cal.BP-10500 cal.BP), were two very similar Late Palaeolithic/early Mesolithic cultures in Scandinavia, and are often subsumed under the name Fosna-Hensbacka culture. This complex includes the Komsa culture that, notwithstanding different types of tools, is also considered to be a part of the Fosna culture group.. The main difference is that the Fosna/Komsa culture was distributed along the coast of southern Norway, whereas the Hensbacka culture had a more eastern distribution along the coast of western Sweden; primarily in central Bohuslän to the north of Göteborg. Recent investigations indicate that this particular area, i.e. central Bohuslän, may well have had the largest seasonal population in northern Europe during the Late Palaeolithic/early Mesolithic transition. This was due to environmental circumstances brought about by the relationship between the Vänern basin in the east, and topographical features in the North Sea basin to the west. The Hensbacka culture evolved into the later Sandarna culture which is found along the coast of western Sweden. The Scandinavian prehistory began when the area became free of ice, at the end of the last ice age, around 11000 BC, with the Ahrensburg culture and hunters living in near proximity to the ice. It took until the 7th millennium BC for forest, wildlife and Mesolithic hunter-gatherers to settle. In southern Scandinavia, a Maglemosian culture (ca 7500 BC6000 BC) developed. The Maglemosian people lived in forest and wetland environments using fishing and hunting tools made from wood, bone and flint microliths. A characteristic of the culture are the sharply edged microliths of flintstone which were used for spear heads and arrow heads. Microliths finds are more sparse from ca 6000 BC and the period is said to transist into the Kongemose culture (ca 6000 BCca 5200 BC). The finds from this period are characterised by long flintstone flakes which were used for making the characteristic rhombic arrowheads, scrapers, drills, awls and toothed blades. My head is spinning from all the names of the cultures I have to wade through, but the Maglomosian seems to be the dominant culture in Northern Europe at that time, and the afore mentioned cultures like the Fosna/Hensbacka and Komsa cultures are more localized. To the west of the Volga we find great rivers which flow west and northwest out of the Black Sea towards the Baltic, The Danube, Dneister, Dneiper and others; and other great rivers which start in the mountains and flow into the Atlantic or Baltic, the Rhine, Elbe, Oder, and Vistula. In this land of rivers there developed a boat people we now call The Maglemosian Culture. They traveled in dugout canoes. The oldest one, found in the Netherlands carbon-dates to 8000 BC. Another from NW Britain is equally as old. Still another from the Netherlands carbon-dates to 6300 BC. Archeologists have discovered that some of the trade items of these boat people originate from as far away as the Tigris-Eurphrates Valley, which of course is the location where Sumer came into existance. The Maglemosian Culture existed from about 8000 BC to 5700 BC. Considering once again that the extent of a language is determined by its range of social contact we may consider that the Proto Uralic language was dominant throughout this entire area. Well, that's nice... now I will have to find out about that Proto Uralic language. Is anyone able to help me with that? JayleMurph?? Please? I think the one writing this on his/her website was a bit off..... I am sure s/he meant Proto Indo European (PIE). Problem is that Proto-Uralic is but a hypothesis established by Juha Janhunen among others. It is still a matter of debate if such a language existed at all. If it existed it went completely undocumented to language heaven. You were busy posting, and you must have missed my edit. I think it must have been Proto Indo European (well, in the North Western part of Europe that is). Maybe something distantly related to the present Euskara, or Basque language (the Celts of Ireland, Wales, Brittany and the people living in the Basque territory are genetically linked). Some language spoken by the ones creating the megalithic culture in Western Europe. But yes, I know, that started a couple of thousand years after Doggerland sank beneath the waves. I think I better let this thread die peacefully. As long as no archeological disvoveries are being made at the present North Sea floor, all we (I) can do is look for needles in haystacks. I think I squeezed all of the juice out of this topic; there is not much more to say about it. It's weird, though.. here we have a large stretch of submerged land, destroyed by mega floods, around 8100 BP, but no mesmerizing legends to back it up. 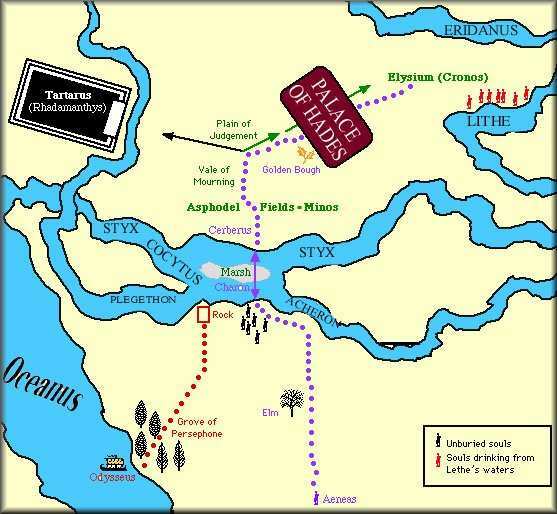 On the other hand, this site is crammed to the brim with theories about Atlantis based on Plato's story, but no one has a clue if it really existed, or where it was located. Weird error; these rivers all flow into the Black Sea. [/i]Weird error; these rivers all flow into the Black Sea. Hahaha, you are right, I didn't even read that. Well, that's what you get after searching and reading for many hours online just to find a speck of information. But I already said the one creating that website must have been a bit off.... he was even more than I noticed, lol. Being drunk is not a good time to post, but who cares, eh? Some here use pot when they post (it's bloody obvious to me, anyway). ONCE there was a land called Doggerland. It was a rich habitat, where the first men quietly roamed on endless sloping meadows. It was the garden of Eden as imagined in paintings. Then, by the end of the last iceage, Doggerland disappeared under the rising waters. In the south, this new sea was called Helle, a name from which Christianity took the word for the archetype of all fear and terror–hell–originating in the belief that the sea was the resting place for the dead. Further north the sea was referred to as Holle, from which came Holland (A. Cornelis, Amsterdam, 1997). With Doggerland drowned, this paradise was lost. TEN THOUSAND YEARS LATER in ancient Greece, it was said there existed a coastline where Hades ruled over the Gates of Hell. It was a land of eternal fog, where the sea rushed over the sandbanks into the marshlands behind. The sun never shined over these sandy shores and not a single tree would grow in this silted swamp. The only people that were able to survive in this inhospitable landscape were known as the ferrymen for the dead. THOUSAND YEARS THEREAFTER, in this unforgiving and uninhabitable land, settlers known as watermen inhabited the edge between land and water. On artificial mounds they lived democratically by the unwritten ewa or Law of Eternal Rights. This law had to be agreed upon at annual gatherings called thing, where he who knows better must say so. Their sole civic duty was to pledge defending their land from the sea (J. van Veen, Den Haag, 1948). On mounds of clay farmhouses and small villages were erected. These terpen were scattered across the land, forming a landside archipelago where the surrounding land was farmed like fishermen harvesting the sea. The external reality of nature conditioned the terp as a model of radical technocratic simplicity. The sea of land remained un-urbanized because it was too dangerous to inhabit, while on the safe terpen a culture of congestion was automatically generated. The level of technological advancement determined the maximum size of the mounds: an archipelago of scattered terpen conditioned this territory of individual parts. TODAY this land is called the Netherlands. After years of dredging, draining, and reclaiming land from the sea, the apocalyptic outcome of this much celebrated manmade country seems near. Half of the land lies beneath sea level, protected by an artificial ecosystem of permanent sand suppletion, dikes and dams. Rising sea levels and the ongoing settlement of polderland make a continuous elevating of the defense structures necessary. If this situation continues forever, dikes will have to rise to inconceivable heights along with the consequences of disaster. The total control of this landscape-artifact resulted in a unified defense line. With external forces completely eliminated behind it, the hinterland is left to unrestrained urbanization. Almost the entire Dutch coast between the Deltawerken and Waddenzee consists of fragile dune formations, maintained by sand suppletion. The Hondsbossche Zeewering is a the only artifact in this natural sea-wall, and as a weak point in the system, the obvious place to contemplate different possibilities for both sea defense and urbanization in the Netherlands. In older Greek myths, the realm of Hades is the misty and gloomy abode of the dead (also called Erebus), where all mortals go. Later Greek philosophy introduced the idea that all mortals are judged after death and are either rewarded or cursed. The Garden of the Hesperides is Hera's orchard in the west, where either a single tree or a grove of immortality-giving golden apples grew. The apples were planted from the fruited branches that Gaia gave to her as a wedding gift when Hera accepted Zeus. The Hesperides were given the task of tending to the grove, but occasionally plucked from it themselves. Not trusting them, Hera also placed in the garden a never-sleeping, hundred-headed dragon named Ladon as an additional safeguard. And I hope you all remember Nehalennia was being associated with apples, death, and dogs (Cerberus?). Does non of you Atlantis addicts have ANY fantasies of your own?? Jesus, Doggerland disappeared after the most giant tsunamis in history. It was something of a Mesoithic/Neolitic paradise. It was a LARGE strecth of land. The people surviving (or maybe even those who saw it coming) fled to the surrounding countries at the borders of the present Noth Sea.They may be the ancestors of the Brittish people. There seem to have been some legends about that disaster, 8100 years ago, but they are very vague. Maybe some kind of remembrance of that event was saved in the stories and myths about Nehalennia.Maybe even in Greek legends about Hades. The North Sea was once called "Helle", or "Holle".And now I think Hades, the Greek legend on which our Christian legend about HELL is based on, might have been based on what happened in what is now the North Sea, but 8100 years ago. Not quite: the edit tool here is screwed. Admins, look into it, ok? There litterally is a "Road to Hell", the "Hellweg". The ancient name of the North Sea is "Hell", "Harla" (Frisian), "Holle", and so on. People in ancient times made a pelgrimage to what is now the North Sea. And many city (and other) names in Holland and Germany point to this pelgrimage. It is said that the Christians took over that name, "Hell", and that from then on the name of the sea was changed into "North Sea". Now why would people go on a pelgrimage to a sea? Well, many people died on that sea, that's for sure. But that happened on many seas, and as far as I know the ancient Gauls and Iberians did not make any pelgrimages to the Atlantic in commemmoration of those who drowned on the Atlantic. Even the Gauls of France and Iberia went to the North Sea, and offered gifts to Nehalennia. I have named quite a few tribes and peoples living around the present day North Sea who may have been the survivors of Doggerland. I have read old sagas (like Beowulfe, The Vala's Prophecy, the Snorri Edda) till my eyes started to water, but as far as I know they are of no great help. So I focussed on the Picts who once lived in what is now Scotland; not much if anything is known of their pre-history, their language, and their culture. The origins of the Picts are clouded with many fables, legends and fabrications, and there are as many theories as to who the Picts were (Celtic, Basque, Scythians, etc. ), where they came from, what they ate or drank, and what language they spoke, as there once were Pictish raiders defying the mighty legions of Rome. Legend tells us, perhaps incorrectly, that Rome's mighty Ninth Legion, the famous "Hispana" legion, which had earned its battle honors in Iberia, conquering Celtic Spain for Caesar is never heard of again when faced against the Picts (they actually surfaced years later in Israel). We do know that the Picts may have spoken a non-Celtic language, (although many Celtophiles feel the Picts spoke a Brythonic-Gaulish form of Celtic language) as St. Columba's biographer clearly stated that the Irish saint needed a translator to preach to the Pictish King Brude, son of Maelchon, at Brude's court near the shores of Loch Ness. At other times the Pictish king lived at Scone, and we know there often were two separate Pictish kingdoms of Northern and Southern Picts. We know that they were mighty sailors, for the Romans feared the Pictish Navy almost as much as the wild men who came down from the Highlands to attack the villages along the wall. We also know that as far as the 9th century they wrote in stone a language which was not far in design from the Celtic "Ogham" script but was not Celtic in context, although Prof. Richard Cox thinks that it is Norse, which has really turned the carefully galvanized world of Pictish academic opinions upside down. By the legacy of their standing stones, we know that they were great artists as well. It is also well known that the Picts were one of Western culture's rare matrilinear societies; that is, bloodlines passed through the mother, and Pictish kings were not succeeded by their sons, but by their brothers or nephews or cousins as traced by the female line in (according to the scholar Dr. Anthony Jackson) a complicated series of intermarriages by seven royal houses. Perhaps the greatest mystery of Scottish or even European history is the people who once inhabited the lands north of Hadrian's Wall and as far north as the Shetlands. Who were these fiercely independent people? Where did the come from? Which language did they speak? What did they call themselves? We first hear of them in the third century from a Roman writer, who describes their fierceness and battle skills. The writer Eumenius, writes about them 200 years after Rome has been in Britain, and the name associated with the Pict is forever coined. To this day, we do not know if this is truly as in "pictus" (the Latin for "painted") or a Latin form of a native name. Because of the isolation of northern Scotland, history yields little, and the Roman Empire's expeditions into the north ended in little gains. "We, the most distant dwellers upon the earth, the last of the free, have been shielded...by our remoteness and by the obscurity which has shrouded our name...Beyond us lies no nation, nothing but waves and rocks"
The above words by the Pictish chief Calgacus are recorded by the Roman enemy in the words of Tacitus and are a perfect example of the obscurity and legendary status held by the Picts almost 2,000 years ago. The earliest recorded evidence of man in Scotland is dated to 8,500 B.C. It is thus that a few thousand years before the birth of Christ, Neolithic men from Spain and France, makers of fire and herders of sheep and cattle had already made their way to Scotland. Some archeologists suggest that these people may have built and used the great chambered cairns which dot the Scottish countryside. It has also been suggested that their descendants eventually merged with the Beaker people (who probably came from northern Europe), and this ethnic union made up the pre-Celtic stock of the northern lands. The link of these early inhabitants to their Iberian ancestors can be found in the many spiral pattern grooves cut into the rocks and boulders of this northern land and which can also be found in Spain, France and Ireland. The design of burial chambers located in the Orkney islands also provide an important link to the Iberian origin of their builders. Farming arrived in these islands around 4,000 BC (3-4,000 years after it started in Asia Minor) and as it replaced the nomadic way of life, the Orkneys became an island fortress with its many stone settlements. By the time Rome became a world empire, the Orcadians were recognized by Rome as a sea power. From recent excavations, it seems that these Orcadian people were a slim, swarthy Caucasian race, with long, narrow heads. In terms of material culture to support such early migrations, Ahrensburgian microlith's have been found in Scotland, and on the Dogger Bank as mentioned. A matrilinear and sea faring society may agree with a seagoddess as Nehalennia, a name of unknown etymological origin (although their are many theories trying to explain the name). Until recently, no finds earlier than the Mesolithic had been found in Scotland, including Ayrshire. It was accepted that although there may have been humans in Scotland in the Palaeolithic period, any traces would have been removed by glaciation and rising sea levels. Recent work on a site near Biggar by the Biggar Archaeology Group has interpreted the lithic artifacts found there as belonging to the Upper Palaeolithic. The finds have close affinities with flints in north Germany and Denmark and may date from 14,000 years ago. It is thought that the site represents a hunting camp of people who had followed herds of reindeer across what is now the North Sea - the map of "Doggerland" gives an impression of what was dry land at this time although at some point the land-bridge was further north. Although we cannot be certain that this group or groups of people ever made their way into Ayrshire, it does raise it as a possibility, especially as the site is only 20 miles or so from Ayrshire. It is also interesting to see that the lower sea levels must have affected what is now the Clyde estuary, with the implication that any routes followed by primitive hunters are irretreviably lost. With the gradual rising of the sea level, the plain eventually became the North Sea sometime in the Mesolithic period though as this whole area of research is so recent, many details have still to be determined. In the context of Ayrshire, one of these is the extent to which it facilitated the spread of Mesolithic people into southern Scotland. 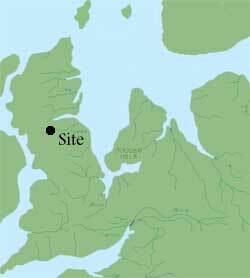 The earliest traces of human settlement in Ayrshire date from the Mesolithic period (c. 8000 BC - 4000 BC). As noted above, it is not impossible that Upper Palaeolithic hunters may have entered Ayrshire from the east around 14,000 years ago after having crossed "Doggerland", although definite proof of this is needed. With the ending of the ice age, in particular the Loch Lomond Re-advance, climatic conditions improved sufficiently to encourage incursions by small groups of hunters. By the time they arrived the tundra-like conditions had given way to extensive woodland with areas of shrubland and more open areas, especially on the high ground. In Ayrshire there would have been extensive areas of marsh surrounding numerous lochs, hinted at nowadays by the flat areas where they have been drained. Just wade through the site, it's worth reading. Now again about these Picts: there is - according to me - a chance their original language (and before they mingled their genes and/or language with those of the later arriving Celtic tribes in the presentday Brittish isles and Ireland) may have been related to that (proto) Finno-ugric language. And maybe this is the case too for the original inhabitants of Doggerland. I need a linguist here, lol. But first read that site, please. Something else: I already mentioned in this thread that the name of the seagoddess Nehalennia may have been of non-Indo-European origin, a name later adopted by Celtic/Germanic tribes. Some linguists have tried to explain it as either Celtic or Germanic in origin, using etymology, but they are not certain about that explanation. "One point I have to make is that Finno-Ugric and Indo-European are classifications for two totally seperate language families. Finnish might be spoken in Europe, but it is just as seperate from the Indo-European languages as Basque is. We linguists get a little niggly about the different classifications! It would be possible to track Nehalennia's origins through language use, though, and Ragnar is right in thinking that Nehalennia sounds much more Finno-Ugric than Indo-European, I've never seen a word outside of Finnish that resembles the same pattern! " -5- Doggerland got flooded and whiped from the map by a giant tsunami at around 6100 BC. -6- Those who survived the deluge (by being at a safe enough distance, or surfing the hell out of there by riding the tsunami, lol) fled to Scotland, England, Belgium, Netherlands, Germany, Denmark, Norway and Sweden. -10- The Germanic name "Hel" or Celtic "Hal" (and lots of similar names) are the names of the old North Sea. There are even pilgrim roads through Germany and the Netherlands that are called "Hellweg", literally, "Road to Hell", Hell being the old name of the North Sea before the Christians stole it. Over time the name Hell became synonym for everything evil. Maybe "hell" was connected to the original name of Doggerland, in some proto -IE or proto Finno Ugric language. Let's just name the language Proto and be done with it. And now for something completely different.... Pyramids (!!). Yes, I have suggested that the number of participants of this thread would grow as soon as something with the shape of a pyramid would be found on the bottom of the present North Sea, lol. That inhabited land once existed between Scotland and Scandinavia has been confirmed by Exeter University's Doggerland Project, named after the Dogger sandbank where prehistoric artifacts have been dredged up. Could the Isle of May have been anciently revered as the last remaining vestige of that sunken land yet remaining above the waves? In an earlier post I said I would already be happy if they found something like New Grange (Ireland) or Stonehenge or any other megalithic structure like there are in north western Europe. But I also said that the megalithic period started a couple of thousand years AFTER Doggerland got submerged. Well, I found out I was wrong once again; I did find some megalithic structure, online, in Denmark, dating to 5800 BC, just a couple of centuries after the deluge that flooded Doggerland. Yeah, yeah, this is not about a fancy civilization with flying saucers and pyramids and magic crystals and wise men transporting themselves to the stars, but I need some help here. I know it's there - that structure in Denmark - but by god, I cannot retrace it. this topic got brought up in the noah thread, and I felt like it deserved its own. its an interesting topic and one that touches on research Ive been conducting for several years. ive never heard of doggerland??? ive heard of atlantis of course....any other lost or forgotten lands that i could reseach? Well, read all about Doggerland here, lol! Of course it's not the real name, it's the name scientists gave to the land now beneath the North Sea, and it's name is based on a undersea hill, the "Doggers Bank". Other lost lands? Check "Sundaland". "It has been recognized for a long time that Northern Norway was populated before the inland Scandinavia glacier melted. The inhabitants came from the West: England, the plains situated at the location of the present North Sea, and Germany. The archaeological findings of these areas have been classified as belonging to the Maglemose culture which now is considered to be largely similar to the Narva culture located to the East of the Baltic Sea. Thus it must have been the same population and probably also the same language. The immigrants were attracted to the Northern shores by abundant game for hunting and a chance of sea fishing. The White Sea cliff drawings of the later comb ceramic era show whalery in which large sea vessels (resembling the umiak leather boats of the Eskimos) were used, already aided by such developed tools as the harpoon and and an attached buoy which prevented the prey from diving. It is also known that the Basques practised whaling using small boats as late as the historic period. " The rest of the site is very interesting, not only because of it telling us what language the Doggerlanders may have spoken (or where they went to).